I had a whole bunch of stuff written here at first, and then I realised it didn’t really matter. This post is supposed to be about the images that came from my cameras during 2018, so if anyone out there enjoys seeing what I see, here they are…. 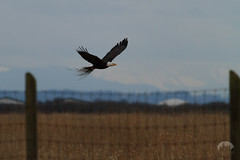 32nd Annual Wintering Bald Eagle count. We did the upper Squamish route from the Ashlu bridge to the Elaho Valley turn off. It was a foggy day, but it’s always beautiful up there. Exploring the massive boulders in the forests under the face of the Stawamus Chief. The clouds break temporarliy, allowing a brief view of one of the gullies between the major peaks of our granite monolith. Another winter scene from the Estuary. It’s difficult to tell, but I like the eagle in the tallest tree, watching out over the landscape. Fresh snow on the Mamquam River on a sunny winter morning. I try to remind myself on a regular basis that I am extremely lucky to be here. Looking out over my little neighbourhood at the base of an incredible piece of geological history. A Bald Eagle makes it’s way across the sky during a little snow storm. This was the last time I photographed one for the 2017-18 “season”. February. My two loves. My wife who I’d be lost without, and my dog who is apparently quite tall when you stretch her out! That cheeky face. She wakes me up every morning with her gentle nudges to go outside and play. Absolutely loves the snow. Tara continuing to grow her riding skills, gradually letting off the brakes some more and picking up some speed. 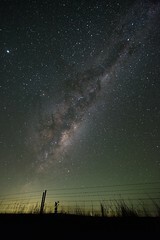 The Milky Way Galactic core as seen from Freycinet National Park in Tasmania. Dark skies down there. I hope it stays that way, the stars were astounding. Tara making her way up the ridge on our way to a campsite on the other side of Cradle Mountain, in the background. Spectacular hike, can’t believe I had never been, when I grew up so close. We slept in the wilderness one night, and our own bed in Ballarat the next. Same hike, almost at camp. Back side of Cradle Mountain, we arrived at the “Artists Pool” at a fitting time. The clouds that thwarted my night sky plans did at least redeem themselves come dawn. Last morning in Australia after a very quick 18 day visit. Ballarat Train Station. Airport bound. First ride after returning home. Tara appears from forest with her trail buddy in tow. Suddenly back in Ballarat. The architecture and history is appreciated on a whole new level now. Hoping for a good moonset at dawn, but it was a little cloudy. The centurion statue shown lower left was a detail in Ballarat I had never paid attention to before. Mammatus clouds. A rare sight, and this is the best example of them I have photographed. I love exotic cloud formations but don’t often witness them in this part of the world. The first reasonable Hummingbird image I captured with a telephoto lens. The beginning of a journey that is still unfolding. They have absolutely captivated me with their impressive plumage and incredible personalities. Very curious and quite charismatic. Female Rufous Hummingbird scratching an itch, just a few feet from my lens in the bushes off my back deck. Male Anna’s Hummingbird checking me out after some battling with another male over our trees and bushes. They are incredibly inquisitive birds. The same Male Anna’s Hummingbird stretching his wings. Their gorget feathers feature irridescent flashes of pink, purple, yellow, red and blue. All of them are angle-of-view dependent. 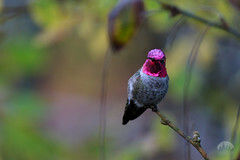 A female Anna’s Hummingbird with her beautiful purple-pink throat patch. Female Rufous Hummingbird. She was really fond of our hanging baskets. A young male Anna’s Hummingbird having a scratch. This one I believe is a young male slowly having his gorget feathers grow in. The planet Venus and it’s conjunction with the moon in the summer of this year. When Autumn begins to arrive the forest seems to just “feel” different. Maybe it’s the angle of the sun. Mountain Biking in the Fall. There are few things better. Howe Sound on a rainy Autumn day. Clouds lifting after some serious rainfall. Sunlight through a tiny hole in this fallen leaf. Boy have I learnt through experience photographing these little birds. They move so fast it’s unbelievable. Hard to believe but it’s Autumn and these guys are still in the backyard. Sticking it out for the winter. This Male appears to be molting his gorget feathers but I need to understand more about this process to be certain of it. One of the many impressive local mountains with the clouds lifting. Squamish Valley. Mt Cayley is a volcanic massif with several peaks all slowly decaying away. Squamish Valley Bald Eagle. It’s crazy to be able to capture a photograph of an eagle like this out of the car window! So close! Hummingbird saying hello on Christmas day! A juvenille Bald Eagle with Coho Salmon. I waited an hour for this eagle to trust me that it was ok to come down from the tree to continue feeding. Another winter Hummingbird shot. The light or lack thereof in winter makes it really challenging to capture them, but when there is a bit of diffused sunlight things get a little nicer. King of the skies. I love this shot of a calling Bald Eagle. Head back in full song. A recent wind storm has snapped one of the branches you can see in this frame. After several rainy days, a sunny one is a welcome opportunity to dry out. With the snowpack in full spring melt after extended stretches of unseasonably warm and sunny weather, the thundering plunge pools of the provinces big waterfalls were something to witness. A Wedge Tailed Eagle dancing on the wind in rural Victoria, Australia. I hadn’t seen one of these in the wild since my early twenties. Female Rufous Hummingbird showing off her painted retrices. I discovered a family of Barred Owls in the forest near our place. They were always being harassed by other smaller forest birds. We kept two feeders filled on a weekly basis. The turf wars over whose food it was kept us constantly entertained. Surprisingly tenacious and aggressive for such a tiny creature. Dragonflies. 300 millions years of evolutionary excellence. Summer lake days gives opportunity to photograph them buzzing around snapping up the mozzies. Lukla loves the beach. In this moment she is trotting in the half-light of the shadow of the chief as the sun breaks the summit. Fleeting but beautiful. Oh yeah, got married! West Coast girl 55 and I in the old growth forests of Vancouver Island. Another young Male Anna’s Hummingbird with its gorget feathers coming through. I think, anyway. The almighty Chief in pleasantly soft evening light. We had a lot more rainbows this year. That I witnessed anyway. THUNNNKK! This poor guy hit the window pretty hard and dropped to the deck. I jumped up to go outside and see how he was, but he had already picked himself up and flown up a few feet onto this branch. 30 mins of shaking it off and regaining his composure, and away he went. 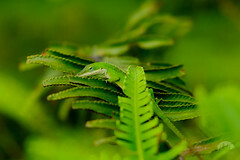 Through a gap in the foliage. More molting. This guy flew right up to me at one point within a couple feet of my face to get a good look. Large and Small. Garibaldi mountain, and a dragonfly. Mountain Biking in Derby Tasmania. A great day on the trails here. Steak Sanga and a beer at the Weldborough Pub for lunch before another shuttled descent. Excellent! My wife and I lay back on our tent pad and just looked up through the Eucalypts at the stars above. It was a moment with a real “home” feeling to it. Wilks and Dove Lake, the Honeymoon islands and stunning alpine Autumn colours. Spectacular hiking at Cradle Mountain, Tasmania. Misty mornings on Vancouver Island. Muted sunset light, West Coast Vancouver Island. A male Anna’s Hummingbird on Vancouver Island in a friends garden. They have them year round every year. Our very own Cherry Trees are brilliant in the spring, and just as beautiful in the Fall. Large eddies form where a fast and hard flowing creek joins the outflow of Clearwater Lake. Ballarat has changed significantly since I have left. I loved the art installation in this laneway, and the Hop Temple at the end of it! Sunlight illuminating morning mist rising off the cliffs of the Stawamus Chief. Captured from our front yard. Had a long time friend visit Squamish this Summer, it was interesting showing him and his partner around our ‘hood. The lush forests around Alice Lake Provincial Park are a lovely way to spend a couple of hours. Sudden direction change at the sighting of food. Their aerial Acrobatics can be really impressive. 3 Eagles soaring on the thermals above the Squamish River, with the ever present Stawamus Chief in the background. Hotel trees. I like the remaining little bit of Autumn colour in these Cottonwoods. This “only” features 26 Eagles, where one of my largest Hotel trees had 44 in it. In some stretches there are numerous stands of trees like this, hundreds of Eagles visible from where you stand. Adopted a new favourite trail in town. It’s steep and technical lines are a challenging thrill that is exactly my style. Great views from some sections. …and on and on! So lucky to get to ride in this incredible place. The glowing green of some forest grottos are mesmerising. Adult Bald Eagle with a fresh chum carcass in a Salmon graveyard. Even at significant distance this bird did not trust me one little bit. That branch. There is ALWAYS an Eagle on this branch. This sub-adult was pretty content with me capturing his portrait. *edit, on todays Eagles count, there was not an eagle on that branch! Dike Fly-by. Just cruising past us at the Shelter at Eagle Run in Brackendale. Unique experience on this day. A Sub-Adult Bald Eagle stole some food from an Adult and landed low in a tree right by the viewing shelter. It sat there and devoured its food despite the presence of a dozen people right underneath it. I love the intricate details of its head and neck plumage as it transitions into the full white head of an adult. This years Bald Eagle count took us well up into the Squamish Valley thanks to slightly more favourable road conditions. Our team came in with 296 Eagles, adding in for a total 1157, the largest for many years now. I like the challenge of finding the not-so-easy to spot Eagles, like the 4th one in this photograph.